I had this beautiful visitor at my home. 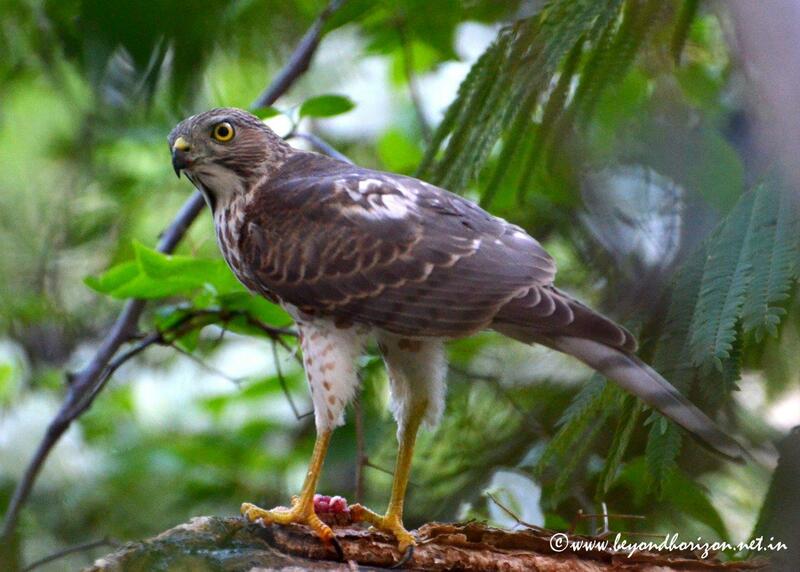 Besra sparrowhawk (Accipiter virgatus) is a medium-sized raptor and feeds on lizards, dragonflies and small birds and mammals. In front of our balcony, there is a large bougainvillea and a tamarind tree, their foliage creating a small nook between the building and the tree, that remains hidden from the road. One afternoon, I noticed an unusual movement and then spotted this bird there. It was perched on a branch, with a mouse it had just caught. Soon it was eating the kill, while periodically looking out for any danger that might be lurking around. That was enough time to get my camera and find a suitable position. It saw me and looked into the camera. Though startled, but it probably didn’t find me threatening and continued on its kill. When it was almost done, suddenly a crow noticed it and attacked noisily. Before the crow could come any closer, it flew away swooping through the branches! 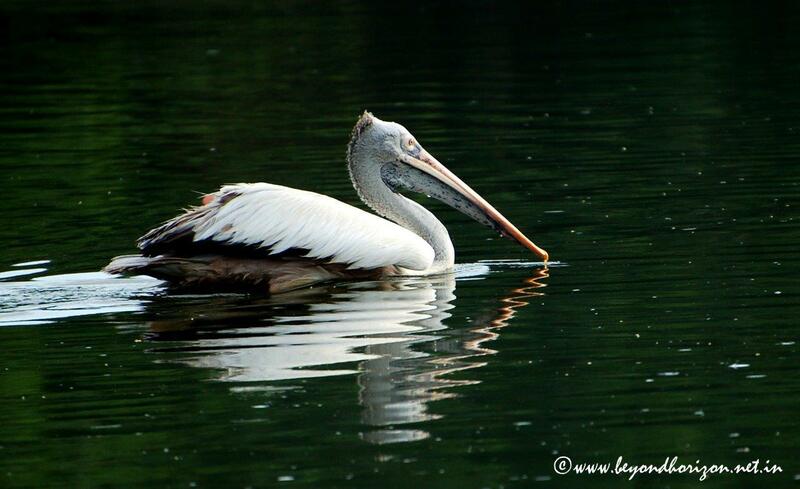 The spot-billed pelican or grey pelican (Pelecanus philippensis) is a relatively small pelican, but still a large bird. It is 125–152 cm (49–60 in) long and has a weight of 4.1–6 kg (9–13.2 lbs). It is mainly white, with a grey crest, hindneck and a brownish tail. The pouch is pink to purplish and has large pale spots, and is also spotted on the sides of the upper mandible. The tip of the bill (or nail) is yellow to orange. It breeds in southern Asia from southern Pakistan across India east to Indonesia. It is a bird of large inland and coastal waters, especially large lakes. This species is a colonial breeder, often breeding in the company of other waterbirds. The nests are on low trees near wetlands and sometimes near human habitations. 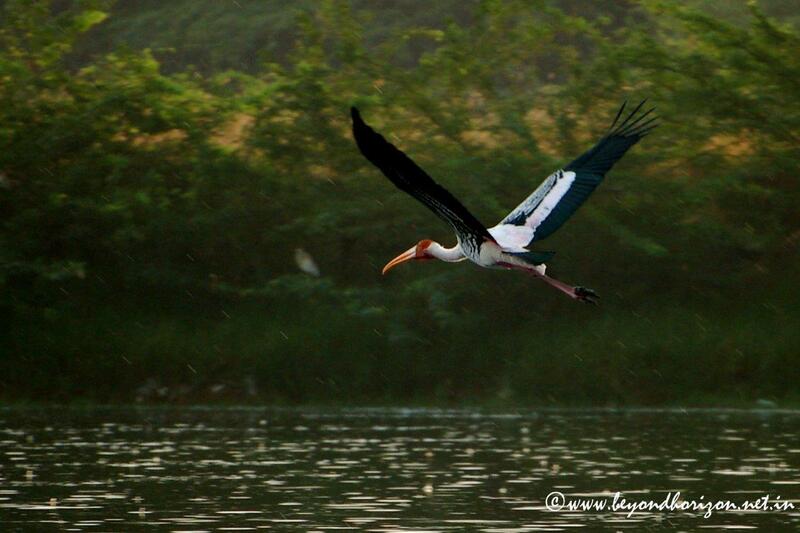 The painted stork (Mycteria leucocephala) is a wading bird in the stork family. For a stork, it is medium-sized, standing about 93–102 cm (37–40 in) tall, 150–160 cm (59–63 in) in wingspan and weighing 2-3.5 kg (4.4-7.7 lbs).Their distinctive pink tertial feathers give them their name. It is found in the wetlands of the plains of tropical Asia south of the Himalayas in the Indian Subcontinent and extending into Southeast Asia. They forage in flocks in shallow waters along rivers or lakes. They immerse their half open beaks in water and sweep them from side to side and snap up their prey of small fish that are sensed by touch. As they wade along they also stir the water with their feet to flush hiding fish. They also take frogs and the occasional snake. Like all storks, they fly with their neck outstretched. They often make use of the late morning thermals to soar in search of foraging areas.